Gero - Neuroscience has for a long time just passively recorded the function of the brain and tried to draw conclusions from these observations. But, of course, in order to really understand how a system works, you have to be able to control it. We do this by hooking up the gene that encodes the light sensor to a gene that’s linked to a particular characteristic of the nerve cell. Tom - In simple terms, what Gero is saying is that they first identify the neurons in the brain which they think are responsible for a particular behaviour. 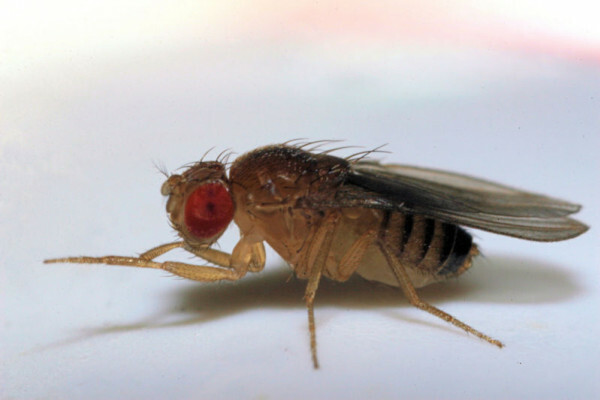 For example, the area of a fly’s brain that causes it to go to sleep. The DNA of these cells is then altered such that the neurons can be turned on by red light. I’m now outside the room where experiments on the flies are being conducted and we’re just about it enter. It’s going to be very dark. Yes, as I suspected the room is really dark. There’s a little patch of green light illuminating what I can see on the screen is a little fruit fly inside of some kind of very small (the size of one pence coin) little rubber walled area it seems. The fly’s just sitting in there not moving and has a green light shined on it from above. So Gero, what is it I’m looking at? Gero - You’re looking at a fly that is just having it’s afternoon siesta. It’s about 2.30 in the afternoon at the moment, which is when many flies are sleeping. So what you’re seeing here is not optogenetically induced sleep but just normal, natural sleep. Tom - Okay. We’ve brought out a second fly now and this guy is definitely not having a nap. I can see him moving around on the screen and, if I look down really closely, I can see the tiny eye. It’s just fluttering his wings and seems to be grooming himself almost. Now we’ve turned on this high 60 flashes per second red light and the fly’s stopped moving. He’s kind of sprawled his legs, almost like a starfish, if you can imagine, if you’re really tired and fall face down onto your bed with all your limbs spread out. Pretty much what the fly’s doing and he has completely stopped moving. Is it safe to assume the fly was asleep there? Gero - By every behavioural criteria, yes. We know that the flies when they are in this optically induced state show the classical hallmarks of sleep. That is they don’t move, they don’t support their own bodyweight and they also have heightened arousal threshold. So, if you give them, for instance, a light or a tap meant to wake them up these stimuli need to be more intense to elicit the response. Tom - The red light has now been switched off and, almost instantly, our fly has started moving again. Gone back to shaking his wings around and crawling around on the lid of the dish which he’s contained in. It’s really quite amazing to see how quickly - I mean I can’t wake up that quickly in the morning so I’m impressed the fly can. Previous Could optogenetics cure epilepsy? How does training affect free will?